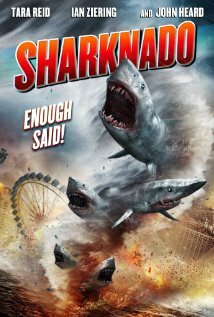 Summary: When a freak hurricane swamps Los Angeles, thousands of sharks caught up in the extreme weather event terrorize the waterlogged populace. Now nature’s deadliest killer will rule both sea, land and air, as the hurricane hurls the cold-blooded killers directly at those attempting to escape. Other Subculture Media Reviews of ‘Sharknado′: Please check Episode #46 of The Good The Bad The Ugly Film Show for more reviews of ‘Sharknado’.